As the third quarter numbers have finally been tallied, Home Media Research has published the sales of both competing high-definition formats and the results are not surprising. Blu-ray Disc has come out on top with close to twice the sales of software as HD DVD. This is right there with the weekly published numbers, however this does give us a look at solid sales figures. From the period between 1 January and 30 September, Blu-ray has sold 2.6 million units while the HD DVD team rakes in 1.4 million in the same period. Since inception for both formats, 3.01 million have sold to Blu-ray and 1.97 million to HD DVD. This means the 2006 year ended with 410,000 and 570,000 for Blu-ray and HD DVD respectively. 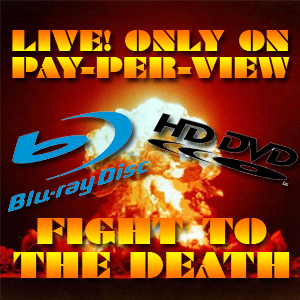 The growth for both formats is 634% for Blu-ray and 246% for HD DVD. Industry analysts are expecting the fourth quarter to be a lot closer with the exclusive release of Paramount/Dreamworks picture’s Transformers and Shrek the Third. Tom Adams of Adams Media Research expects these titles will help boost HD DVD numbers as the year closes but gives Blu-ray the overall advantage. In-Stat analyst Gerry Kaufhold believes the next-gen interactive features on Transformers and other titles will also give HD DVD some help and expects dual-format players to gain popularity next year. In revenue, Adams is projecting $186 million for Blu-ray and $91 million for HD DVD by the year’s end.